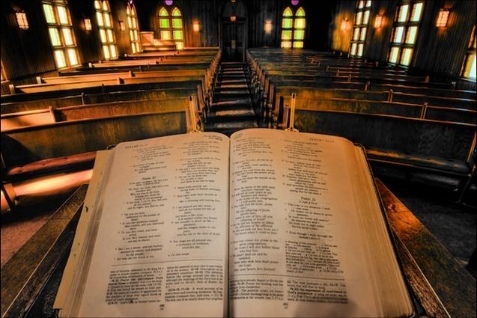 Ever thought about how the room you gather in on a Sunday morning is used? How is the stage set up? What is the focal point of the room? Where do the seats point, and what is the accessibility of the stage? 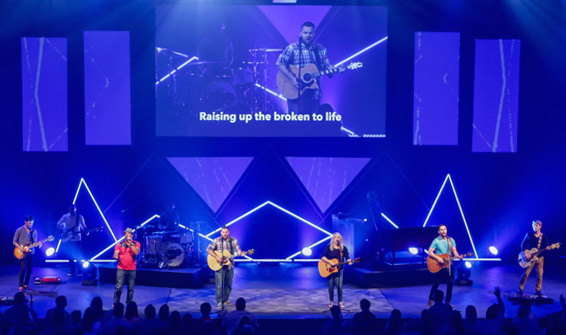 What artistic expressions exist in the worship space? I do. All the time. My worship planning team has had discussions for decades about the sacred space we use in our corporate worship experience. It’s important to understand how our worship environment shapes our perception of our corporate relationship with God. The spaces we gather in on a Sunday morning articulate what we believe about God on a subliminal, intrinsic level. Unfortunately, most of us don’t ever think about it. At least think about it in a thoughtful way. At first, there was no stage. Christians gathered in private homes, Scripture was read and psalms were sung, and the fellowship culminated in a celebration of a meal, the agape feast. Our relationship with God was colored by these intimate experiences, and fellowship with God was associated closely to fellowship with the people of God. As the church institutionalized, so did the worship space. 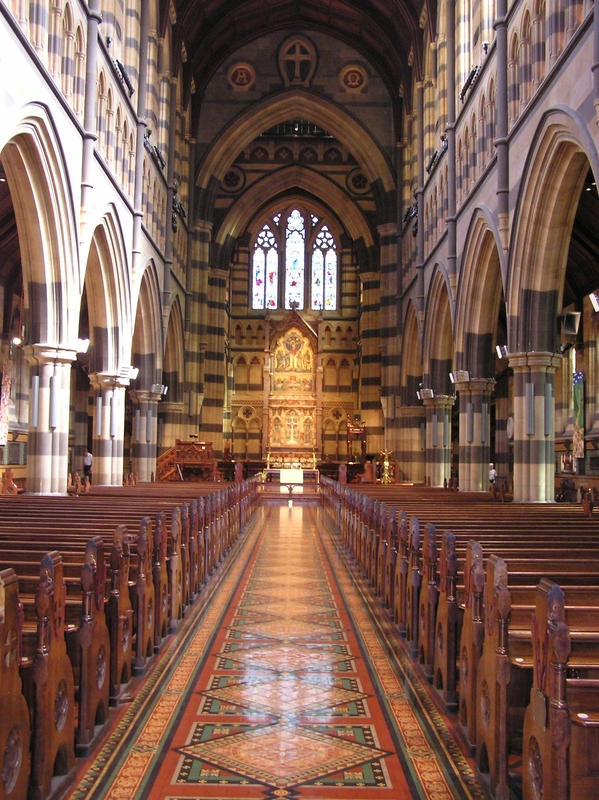 Church buildings were formed according to the architectural constraints of the time. Buildings were punctuated with gothic arches and teardrop shaped stained glass windows, which both told the ancient stories to an illiterate laity and pointed upward to heaven. Seating formed in rows facing the altar, as the celebration of the Lord’s Supper was the climax of the service. Choirs were kept in lofts or set to the side, best heard but not necessarily seen. In this context, our relationship with God was marked by formality, grandeur, and mystery. 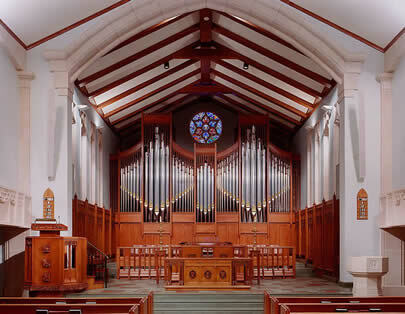 With the development of the pipe organ, church space began to evolve to maximize the instrument’s wide range of sound. Choirs moved to the back of the platform to compete with the organ. The altar was still the centerpiece of the stage, but the music became a more prominent point of emphasis. The worship service began to become more and more something you went to sit and watch, with less interaction between the people of God. And perhaps God also became someone you watched as well. Some time after the reformation, stage design further evolved. With Guttenberg’s innovation came the idea that the Word of God was the primary modality of faith, and thus the paramount feature of the service. Slowly, the communion table—and the sacramental act of communion itself—was pushed to the side, and the pulpit became the prominent focus of the room, and the sermon the climax of the service. God became personal again, but we may have lost a bit of the majesty and mystery. The arts, viewed with various degrees of suspicion, were de-emphasized, particularly the visual and theatrical arts. Over time, evangelicalism lost a sense of the importance of beauty and the arts. 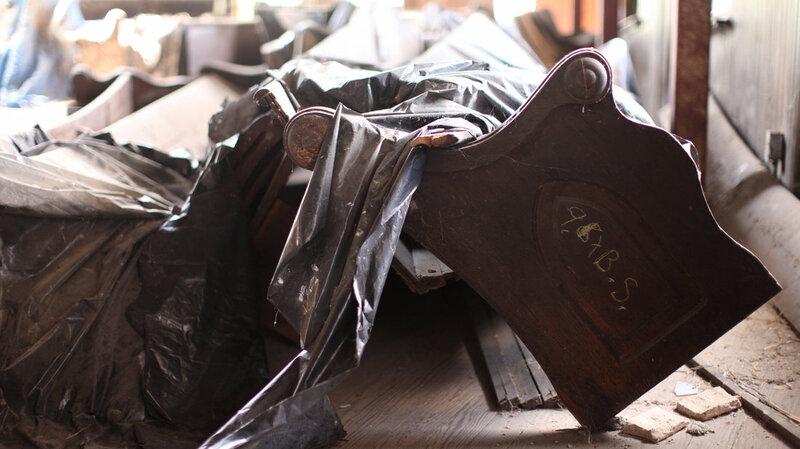 And this loss was reflected in the sacred spaces of these churches. Fast forward to the Jesus Movement, and the focus of the sacred space again morphs. The rock band format—with electric guitars, drums, bass, and lead singers—became the primary focal point of the sacred space. Simply as a matter of course, the stage had to change to accommodate this new innovation. Most people don’t realize that the modern sound system was developed in 1969 at Woodstock, with front-of-house mixing, speaker clusters, and separate monitor systems, and modern church worship buildings have pretty much been constrained by this technological innovation ever since. These days, many modern buildings have appropriated a spartan utilitarianism. Multi-purpose rooms and gymnasiums are often the norm. Seats are set in rows pointing to the platform, where the rock band takes center stage. More churches are adopting a theatrical stage, high and inaccessible, making the congregation more an audience than a community. Lead singers take the spotlight, often times magnified on large screens. Some larger mega-churches (and wanna-be mega-churches) make use of laser lights and smoke machines. There’s an emphasis on people’s personal (and even solitary) experiences with God through the stage performance—and the stage performer. And while all of these things are merely signs of our technological times, it does beg the question: What are we now communicating about the nature of God in these worship spaces? What are we teaching people about the community of the church, the essentials of our faith, the importance of beauty and truth? Interestingly, there’s a small but growing movement back to the sacred. Some young people are rejecting the lasers and concert dB-level music. Disillusioned by the Disney-fication of Sunday worship, they are drawn to liturgy, to mystery, to ancient future expressions of the faith. Others are choosing to forego the luxuries of the mega-church in favor of small, neighborhood churches or even smaller house fellowships. But a larger, more troubling trend is that many people—from boomers to millenials—are choosing to simply leave the institution of the church entirely. I don’t necessarily have any answers here. I simply want to point out that our worship space speaks a theology to the people we minister to, the people we do life with, the people we are trying to reach. And it’s something we should think about. A lot. Posted in christianity, church, music, religion, worship, worship leaderTagged art, faith, worshipBookmark the permalink. Thanks for your additional insights Paul. We should probably talk more! Manuel, I’d love to meet you someday! As a Reformed, Presbyterian, boomer who enjoyed a CCM recording career, I have played in so many worship spaces! My current vocation is as director of music in a traditional neo-colonial building with a retrofitted contemporary stage. The new stage was designed with the building’s architectural integrity. We have a real piano, a B3 organ, and Electronic drums behind a discrete liturgical wall. The congregation is cross-cultural white and black, so even though we have pews, there is an active, vibrant atmosphere and even a little dancing in the aisles now and then. Thanks for your insights. If you’re ever in northern California, please let me know! God bless you and your congregation. Wow, I love how you’re thinking/sharing about this! This is so deep and Im sure I will need a re-read. Thanks for your encouragement Jasmine. God bless you today.